Please click on the following link http://bit.ly/ARTFstudy. Let’s unleash our Debt and move to a debt free future! If you would prefer, to complete a questionnaire by hand, please pick one up in church or in the Parish Office. This is the final week of the survey! The Survey will be taken down on July 5th! 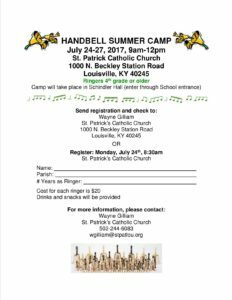 Ringers 4th grade or older. Cost of each ringer is $20. Drinks and snacks will be provided. Registers can be taken day of event. https://www.staloysiuspwv.org/wp-content/uploads/2016/08/header-logo-3-300x153.png 0 0 Mandy Kumler https://www.staloysiuspwv.org/wp-content/uploads/2016/08/header-logo-3-300x153.png Mandy Kumler2017-06-21 13:30:402017-06-21 13:30:50Handbell Camp! Vacation Bible School 2017: Thank You! Thanks to all those who participated and contributed to Vacation Bible School this year. We had a great time. We were blessed with beautiful weather, a little cool on Wednesday for wet and wild, but very nice for the rest of the week. Special thanks to Sally Sauerbeck for sewing over 250 bandannas in fifteen different colors for the children to wear. This was a marvelous idea of hers that helped the small group leaders identify their group by color. We greatly appreciate her stewardship. We also want to give special recognition to Pam State and her family who decorated the stage. The set was so professionally done. Folks who saw the stage on Friday came in on Monday and couldn’t believe their eyes. There was a rocket in the entrance way,on the stage you found a robot, another rocket, flashing lights, and moving parts all over the place. It was a true masterpiece. We had special visitors join us too, Fr. Jack and the Chick-fil-A Cow. Click the link to view our photo slideshow. https://www.staloysiuspwv.org/wp-content/uploads/2016/08/header-logo-3-300x153.png 0 0 Mandy Kumler https://www.staloysiuspwv.org/wp-content/uploads/2016/08/header-logo-3-300x153.png Mandy Kumler2017-06-09 10:45:152017-06-09 10:45:50Vacation Bible School 2017: Thank You! There is still time for you to share your opinion!